After a delicious meal and tons of dancing, guests begin to get hungry again as the night draws to a close. If it fits in your budget, bringing out a "midnight snack" is a brilliantly kind thing to do for your guests. Fancy time is over, though, and now it's time to really have fun with your food choices. 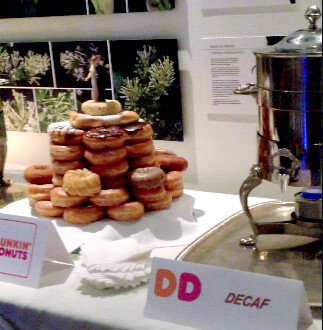 The Donut Cake is a whimsical way to present a tasty treat, and this particular one was paired with coffee for a fun police-themed spread. If you love this idea but can't afford an extra course, do away with the normal dessert table and make this doughy delight the sweet treat. Love this idea! 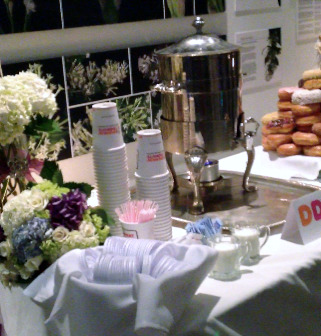 We actually did a doughnut bar for my sister's baby shower and it was a huge hit.